Welcome to the Renovation Projects UK Bargain Property List. Register here for immediate & FREE access to our bargain property list of renovation & modernisation projects & BMV Properties new to the market (or still available) in the U.K. Only available here! Our list covers the whole of the U.K. and is updated weekly and arranged into geographical areas. Subscribe now to be the first to be notified when these property renovation/modernisation projects and below market value properties hit the market! The list is produced in house and is unique to renovationprojects.uk – Fill out the form on the right to get immediate & FREE access to the latest list. After clicking the Subscribe button you should see a “thank you for subscribing” message on screen. You will then receive an email with a link to the latest renovation projects list and also a link to download your free ebook (see below for details). Any problems please contact us. Register now for immediate FREE access! 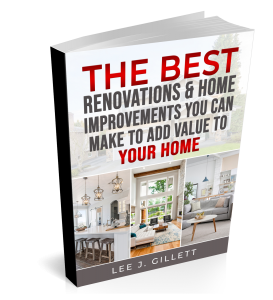 Register now and also immediately get “The Best Renovations & Home Improvements You Can Make to Add Value to Your Home” ebook absolutely FREE! Register by completing and submitting the form below. There will be a link to download the ebook within the “welcome” email you will receive from us within minutes. More information about the RenovationProjects.uk property renovation & modernisation projects list. We have created bespoke software that trawls the two largest property portals in the UK, namely RightMove and Zoopla (and now also OnTheMarket.com) to discover the latest bargain property renovation & modernisation projects (including below market value properties and properties up for auction), in all price ranges, that are new to the market or are still available. We then compile those renovation opportunities into a geographically arranged list and email it to list subscribers every week. Subscribers are then free to click through to each property to get further details of that property renovation project. This process, if you had to do it manually yourself, would literally take you days or weeks. Therefore access to this list not only saves you a great deal of time, it also puts you in a prime position to act fast on property renovation/modernisation projects & below market value properties new to the market (or still available). As well as bargain properties in need of renovation and/or modernisation and other bargain properties our list also includes below market value properties as low as £5K. Plus we also make you aware of some great 3rd party property and investment offers as we discover them – all for FREE. Fill out & submit the form above to get started and to see the latest property renovation projects list immediately!